The aim is to investigate how the apparent brightness of a tungsten filament lamp depends on the distance from it. It is intended that results obtained should be related to the inverse-square law as it relates to gravitational, electric and magnetic fields. Since light is a slightly less abstract than any of the former fields it should be easier for the pupil to appreciate that the inverse-square relationship is a consequence of the geometric properties of three dimensional space rather than due to nature of the fields. In order to make the connection with field theory, pupils will need to have a quantitative knowledge so it is anticipated that this experiment will be conducted by pupils who are post KS4, ie. 17–18 years old. A knowledge of potential divider theory will be required for students to understand the method used to monitor distance. The idea is to use DrDAQ to provide simultaneous measurement of both distance and brightness. Since only the form of the relationship between the two quantities was being investigated, absolute measurement of distance was not required. The uniform drop of p.d. across one metre of potentiometer wire was therefore used to provide information regarding distance. This was measured using the 'Volts' input terminal on DrDAQ. The potentiometer was fitted with fresh clean wire immediately prior to the experiment. The following circuit diagram shows the main setup of the apparatus. Further details are provided in the sequence of photographs which follow. The following photograph shows the general layout of the apparatus. The stabilised power supply is included but the PC has been left out in an attempt to improve clarity. The lamp was mounted onto a small piece of wood. The bare end of a 4mm plug was fixed to the underside of the wood and rested on the potentiometer wire. DrDAQ measured the p.d. between the 0 volt end of the wire [nearest end to the lamp] and the 4mm plug. Details of the arrangement of lamp and plug on the wood are shown in the following photographs. DrDAQ was placed at the far end of the potentiometer wire with the light sensor facing the lamp and directly in line with it. 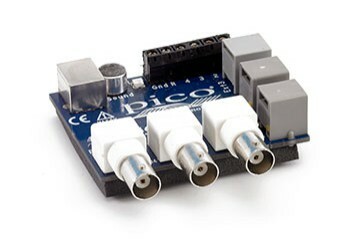 Either PicoLog or Picoscope could be used. In the first experiment, PicoLog was used. A version using Picoscope is described separately. DrDAQ was set up to sample every second, collected while the lamp was progressively moved along the wire. Typically some thirty or so samples were collected each time the experiment was performed. Care needs to be taken to ensure that the 4 mm plug under the wood block remains firmly in contact with the potentiometer wire whilst it is being dragged along its length. A typical set of results are shown in the following figures. What is happening to the voltage between 10 and 35 seconds? What does this tell you about the distance between the lamp and the light sensor? The same is not true for the time interval before and after this. What do you suppose is happening at these times? Check your answers to these questions before going any further. Between 10 and 35 seconds the voltage is changing linearly [or very nearly so]. Is the same true of the brightness? Study, carefully, the part of the graph closest to 35 seconds. What does this tell us about the relationship between apparent brightness of the lamp and its distance from the sensor? How could we check this, more scientifically? Investigate the effect of distance on the brightness of a laser beam. Import the results into a spreadsheet and investigate the relationship between these two quantities.